This interview took place on: 4/17/11. JFH (Karen Tong): What do you look forward to when you come to Australia? 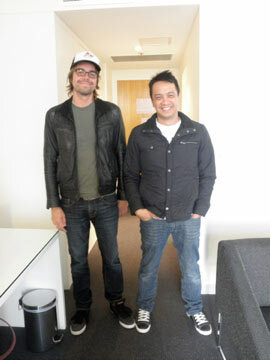 Jerome Fontamillas: The first thing we did when we got here was get a flat white. Drew Shirley: That's right, a flat white. Two of them. Jerome: We don't have them in the States so. Drew: We're coffee fans. Australia is a similar vibe to San Diego, in my opinion. It's got the beach, the surfing culture and English and things that are similar. So it's like taking a long flight and landing back in San Diego. JFH (Karen): You've just won your first Grammy for Best Rock or Rap Gospel album (Hello Hurricane) - what does that feel like? Jerome: *Pointing to Drew* He's a Grammy Award winning guitar player. Drew: Right. *To Jerome* Nice to meet you Grammy Award winning keyboard Jerome Fontimillas. What a great thing, what an honor. I think my dad and my neighbors finally realized I was in a good band. Drew: It finally got their attention. I've been doing this for twenty years and you win a Grammy and all of a sudden people are like "wow, people really are listening to your music." Jerome: It's an honor to receive an award of that stature, but for us, the fact that we've been playing music and being in a band - this is going to be our eighth album coming out - for us, we're very fortunate and we're very blessed that we can still be in a band, make music, perform for people. That, to us, is probably the most important thing. 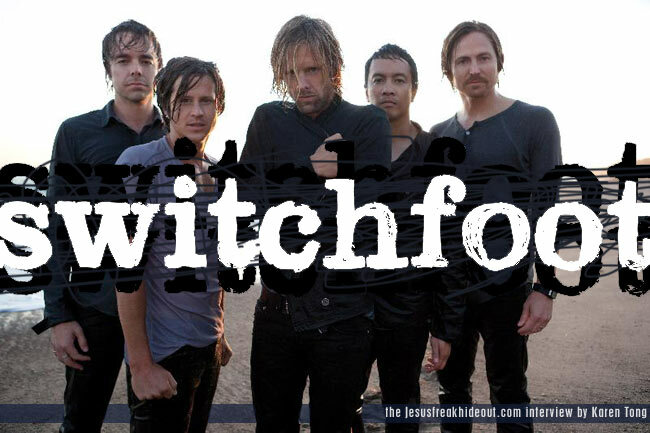 JFH (Karen): What have been some other dreams that have come true for you since being a part of Switchfoot? Jerome: When I first wanted to be in a band, it was because I wanted to travel. To be able to come to places like Australia; to be able to go to where I was born in the Philippines, to be able to go to Europe - those are dreams come true to me, just to be able to travel and play. And seeing people singing the songs that you're playing, it's awesome. Drew: Travelling is pretty great. Because when you get there and people know your songs - you're halfway around the world, you don't speak the language somewhere and people are singing the songs that you recorded in your own little studio in San Diego, not knowing who was going to listen to it or where it was going to go. Then you put it out there in stores everywhere and people know it - it's a pretty amazing feeling to hear those crowds sing it back to you internationally. JFH (Karen): On your latest album, Hello Hurricane, what's the most meaningful song for you? Jerome: For me, one of my favourite songs on the album is called "Sing It Out." Because of its simplicity, it's a song about yearning, it's a song about seeking and it's a personal song. It's one of my favorites. Drew: We poured a lot into that album: over a year and a half, over eighty songs, building a new studio, really going through a search of who we are as a band and finding our identity. We really went through a lot on that record and that song really captures the soul of it. It's not a super happy song or very big - it's a slower song with beautiful drop out sections with strings and keyboards and stuff. I think that the seed that we planted with that in Hello Hurricane has really grown in Vice Verses, this new album we've just finished. JFH (Karen): About your new album, Vice Verses, it's an interesting name - what's the inspiration behind it? Jerome: We had the name while we were recording Hello Hurricane. So that's a little tidbit. Drew: Our song was written during that session but didn't make the record so we said, "well, this is going to be the next record." So we already had this connecting theme growing out of it. This record was more concise to me; it's bold, it's more drum and bass focused. You'll hear Jon doing some spoken word almost-talking kind of lyrics which is new for us, a new sound, a new flavor for our music. As far as lyrics go, I think it's the most obviously transcendent albums we've ever made. JFH (Karen): In your 16-year history as a band, what would be your personal favorite? Jerome: You're trying to separate the love for our kids - which one's our favorite? Jerome: When I first heard the song "Dare You To Move" years ago when I first joined the band, I knew that song was special, and playing it every night, and seeing the impact it has always moves me every night. That is probably one of my most favorite songs to play as Switchfoot. Drew: There's something very special about that song - the way it connects to people and lifts people up. Which is what we want to do as a band - bring hope to the hopeless, bring life to the lifeless, bring people out of any darkness. We've seen that song do that over the years. We've gotten letters, emails, pictures, books and all kinds of things connected to that song. It just really resonates with that sense of yearning that is universal with just human yearning. JFH (Karen): As Christian artists, what would you say is one of the big life lessons God has been teaching you recently? Jerome: The concept of Hello Hurricane, the idea that there will be storms in your life, you will face - whether it's relational or environmental, you know, the things that happened in Japan - you're going to be able to face all that stuff. And the idea of Hello Hurricane is to be able to not run away from it but to face your hurricane. Those are the things God has been teaching me in the past few years. JFH (Karen): You guys are also involved in a number of social justice projects and issues. Can you tell me more about Stand Up for Kids? 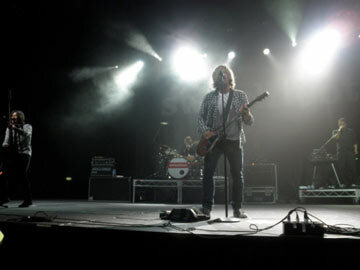 Drew: We do a charity event in San Diego called the Switchfoot Bro-Am. It's half surf contest, half concert on the beach, half community festival type thing. We have a few bands come up and play it. We have a stage right on the beach in our hometown, home city. And all the proceeds go to Stand Up For Kids, which is a local charity that helps at-risk youth, which is something that's close to our hearts. We've been down there volunteering and met with them and have seen the work they do, and it's very powerful. It's very good work. It's very above board and changing lives - it's what we want to be a part of. It came from a desire to be a part of something bigger than ourselves and we're honored to be associated with them for all the great work they're doing. JFH (Karen): Just to wrap up, I'd like to know a bit more about your band. Can you dish the dirt on yourselves or your other members? Jerome: Back home we go to this one spot - while we're recording, we stop there, get a cappuccino and go record. It's just our daily routine. Drew: It gets you started in the right direction you know, get's everything going. Jerome: Which we don't mind. The funny thing about those three is they would plan their tours around finding surf spots. Drew: Because we go from here to Indonesia, to Bali, to the Philippines. Jerome: And they're like, "ok, where can we surf? Where can we get some boards?" Drew: They're strategically planning their concerts around good beaches. JFH (Karen): So who is the guy you would go to for advice on the big issues in life? Drew: Jerome. He's the most wise. Jerome: I'm the oldest. I've lived a little bit longer than he [Drew] has. Jerome: No offense to you [Drew], but I got Tim. Tim has some great advice about life issues. I'd go to him. And then you [Drew] second. JFH (Karen): Who would be the most likely to become the US President? Jerome: Is it Butler? I think Chad Butler; I would vote for him. Drew: Chad Butler. I'm voting for Chad right now. Check. Chad. Ballot. 2011. JFH (Karen): It's 2012 the next election, isn't it? JFH (Karen): Who is the prankster amongst you? Jerome: I think it's a toss up because I think Drew would be a prankster but also Jon would be a prankster. JFH (Karen): What's one of the best pranks that you've done? Drew: I got Chad pretty bad on April Fool's Day. I told him the studio got broken into and I was there and the alarms are going off and all our stuff was gone. He was so stressed out and then I was like "they left a note on the computer that says 'April Fools sucker!'" He was really mad. What else? We like to have fun on the road. I don't know if I could share all the pranks that we've done, because then it wouldn't be a surprise anymore. JFH (Karen): Who is the one with the most blonde moments? Drew and Jerome: It might be Jon. Drew: Jon has a tendency to be focussed on one thing. One time we were flying to Canada and his passport - did he leave it at home? - he almost didn't get to go to the show. We had to have it Fed-Ex'd. But Chad got off the plane early one time. He got off at Johannesburg and we were supposed to get off at Cape Town in South Africa. He had no phone, he got down to baggage claim and he was sitting there like where's the rest of the guys? And then he realized, "Oh no, I'm in Johannesburg, I'm in the wrong city!" That was pretty funny. Hello Hurricane is in stores now. Vice Verses is due out June 2011.